We have MORE Kate Spade, Chloé and cats in the shop right now friends! ....it's made from Liberty of London fabric! I love the Liberty prints; they have legit vintage status and always look like a work of art! They are definately the hightlight of this dress, and this dress is pretty awesome, so that is saying alot! Another gorgeous, silk Chloé top. I discussed with someone trying it on how despite the busy-ness of the print, this top still reads as elegant and can be worn with everything from jean-shorts to patterned pants! Weeeeeeeeee! 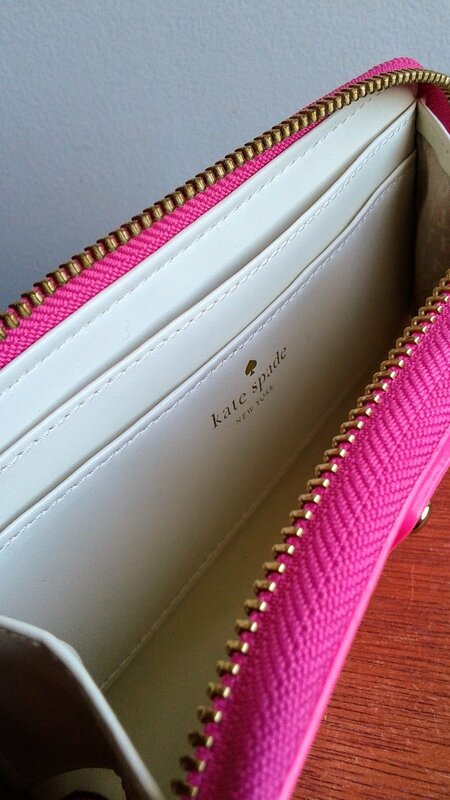 Two great spring wallets from Kate Spade! The patent leather, fluorescent pink one matched the Kate Spade cross-body that we had on Instagram this week. The inside is quite roomy across the width, with slots for cards, but no closing coin compartment, so I'm thinking this would function more as a wristlet. ....and also has one of these old school ID windows! 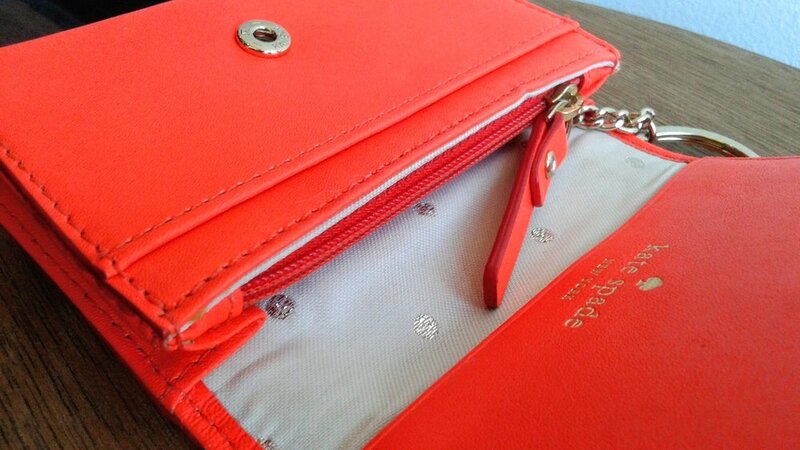 This and the key-chain make this wallet seem so quaint and eager, like it really, really wants to be helpful to you! Just trying to anticipate your needs in advance! Friends, come on. You know that for some reason I find this shirt HILARIOUS! Seriously, I can't get enough of it! It's a CAT. Wearing GLASSES. On a T-SHIRT. Hahahaha! 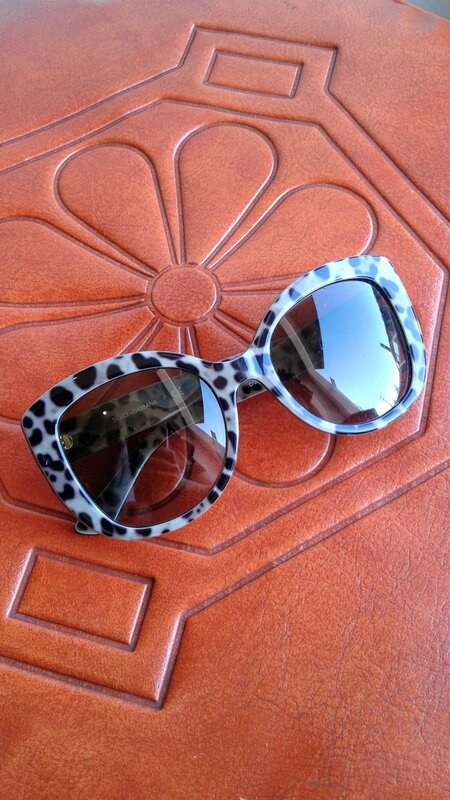 Dolce & Gabbana cat-eye, leopard pattern sunglasses! Show that daylight-savings time who's boss! 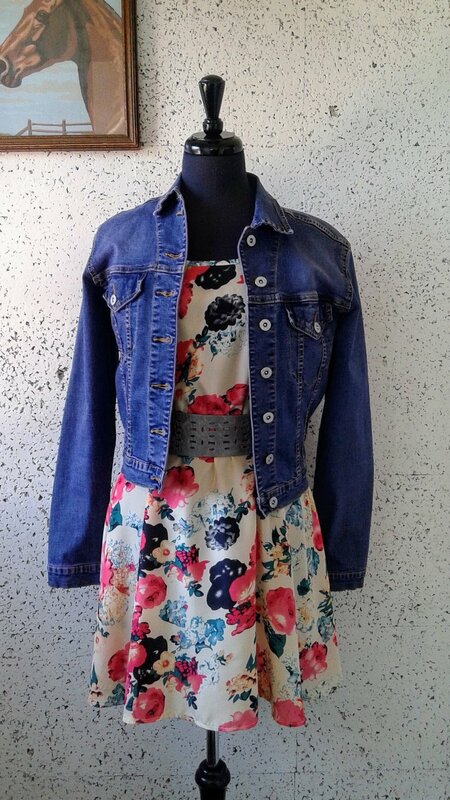 That pink Kate Spade purse on Instagram was modeled on this outfit, and everyone seemed really keen on the jacket! Typically I would find this type of sculpted fabric suspisciously bulky, but this top is a bit cropped and has a great shape and it is totally working for me! I can't wait to see these on someone! Sensible Ecco shoes but with a bit of an edge to them. The way they go higher up the ankle and the large gromets makes them seem a bit funkier and keep them from being too sweet. ....but it has zebras on it! ZEBRAS! This tag also happens to have a luxury brand, silk shirt attached to it! That's me! It's my name on a thing! Guess what? I'll be in the shop all weekend again! Last weekend a Red Pony friend came in and needed an outfit to wear to a gala...that was starting in two hours...that her spouse was emceeing, nopressureoranything. It was so fun finding the dress, the jewelry, how to wear the hair etc all with the help of the other people in the shop! Come in this weekend and I'll tell you all about it! Bahahahahaha!!!!!! I STILL LOVE IT!